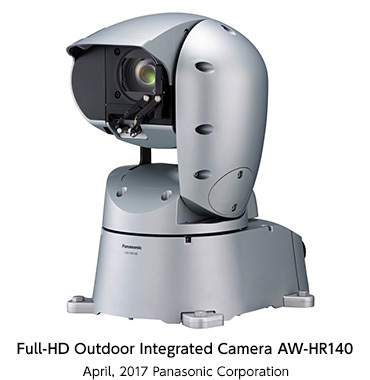 Osaka, Japan (April 24, 2017) – Panasonic Corporation will release Full HD Outdoor Integrated Camera, the AW-HR140. It is scheduled to go on sale in June 2017. Panasonic pan-tilt HD integrated cameras offer high image quality and sophisticated features, and have been well accepted at various applications such as wedding, public facility, conference hall, university, broadcasting station and more. In response to strong requests from customers, the new Panasonic Full HD Outdoor Integrated Camera will finally be introduced. The camera retains the same level of high image quality for broadcasting and business purposes while offering resistance to water, dust, wind pressure and severe salt damage. This allows for installation in tough outdoor environments without the need for a housing. The camera system equipped with 1/2.86-type full HD 3MOS sensors and DSP (Digital Signal Processor) enables advanced video processing, achieving high sensitivity, high S/N ratio, and high resolution. The housing is water and dust-resistant (IP65) and is equipped with wiper as a standard feature. A salt-protective coating helps prevent corrosion, enabling the camera to withstand installation near seashore or breakwaters. The AW-HR140 is equipped with “D.I.S.S. (Dynamic Image Stabilizing System)”, the industry’s first*1 function for broadcast cameras which compensates for vibrations with an optical image stabilization system (OIS) and pan-tilt mechanism vibration compensation function. The D.I.S.S. ensures low-vibration recording even when there are vibrations in the natural world or installation environment, by simultaneously reducing slow, long-wavelength vibrations and fast, short-wavelength ones. Up to 100 units of the camera can be IP-controlled by the AW-RP120G/RP50 remote camera controller via a hub (switching hub). One camera can also be IP-controlled by up to five of the remote camera controllers. Since the AW-HR140 is the first outdoor housing and camera, lens and pan-tilt integrated remote camera in the industry*2 that supports PoE++*3, power can be supplied via LAN cable by connecting to network devices. This outdoor-ready SDI-output remote camera offers flexibility for use not only as an information capturing camera, but also for various applications, such as video capture in stadiums or high-image-quality monitoring in airports. The full-HD outdoor integrated camera will be on display at the NAB Show in Las Vegas, from April 24 (Mon.) to April 27 (Thu. ), 2017. D.I.S.S. will be demonstrated at the Panasonic booth. Equipped with the same 1/2.86-type full HD 3MOS sensors and DSP (Digital Signal Processor) as AW-HE130W/K, AW-HR140 realizes high sensitivity, a high S/N ratio and high resolution through the use of advanced video processing. For installations in places where haze tends to occur, the Haze Reduction Function performs correction for a subject with low contrast to make the image clearer. Three settings can be selected for the compensation level. White-tinged images are reduced and overall contrast is improved. Intensity of haze reduction effect can be adjusted manually according to the density of haze. Haze reduction level can be selected from three stages: low, mid, and high. All functions are guaranteed to operate in wind speeds of up to 15 m/s. Basic performance is maintained at wind speeds of up to 50 m/s without destruction of the camera. In addition, aluminum and other metal parts are coated to protect against severe salt damage, enabling installation in seaside areas subject to salt air. PBT/PPS plastic is employed for the exterior, giving excellent heat resistance. In addition to stabilization by conventional optical image stabilization (OIS) technology, shaking is also corrected by D.I.S.S. to enable smooth recording outdoors. Such shaking could include that from impacts and vibration due to recording outdoors or being installed under certain conditions and that during pan/tilt rotation operations. Since the AW-HR140 is the first outdoor housing and camera, lens and pan-tilt integrated remote camera in the industry*2 that supports PoE++*3, power can be supplied without having to install a power supply or even a local AC outlet. Installation costs can be significantly reduced by connecting to network devices with LAN cables. ●Hubs that support IEEE802.3af/at(PoE/PoE+) are not supported. *1: As of April 2017. Internal data. *3: Abbreviation of Power over Ethernet Plus Plus (the IEEE802.3bt Draft ver.2.0 standard).